Today I received a swift kick in the gut about how much money it actually takes to afford to retire. 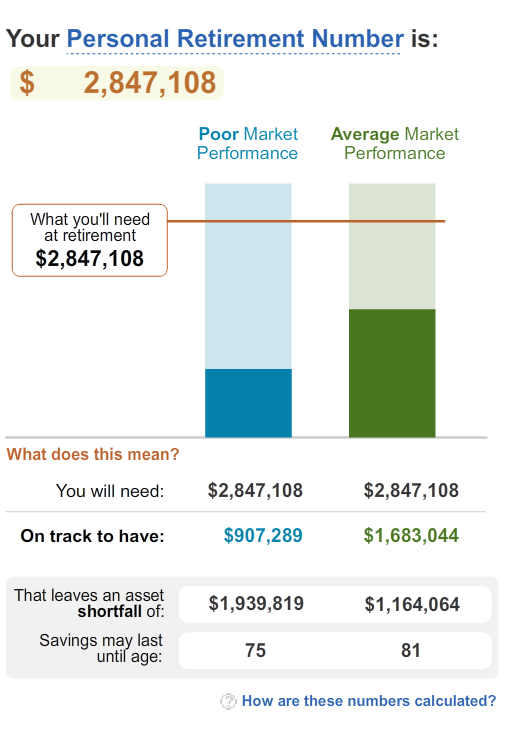 On a whim, I decided to use Merrill Edge's retirement calculator. I could not believe how far behind I am. Take a look at my "Personal Retirement Number" according to the calculator. I'm a mere 33 years and now I'm completely stressing out about how to afford retirement. Yes, you read that right, that's over TWO MILLION DOLLARS!! Merrill Edge suggests that I dedicate 85% of my current salary to retirement. Unfortunately, I'm not alone in being unprepared for retirement. Today CNN published an article on a study done by Fidelity for CNN Money addressing relinquishing 401(k) funds by generation. Perhaps unfairly, Millenials are nonetheless known for a lack of loyalty. We switch jobs more than generations before us. That's a great idea, because chances are you will not obtain a raise of more than the normal COL raise each year at most companies. However, if you leave your job early, there's a chance that your 401(k) investment may not have vested. If your 401(k) has not vested and you leave the company, you lose any matching contributions from your employer. If you switch jobs frequently, that can have a huge impact on your retirement. For example, "Let's say you forfeit $1,700 in company matches three different times early on in your career, for a total of $5,100. By retirement, the overall loss could be worth as much as $36,000..."
Luckily I'm only 33 and I have time to come up with a strategy to afford retirement. I won't rely on Social Security - it may very well be gone when I hit an age I can finally retire. My only chance is by being financially intelligent and proactive. While it was hard to come to terms with the fact that I can't afford retirement, I know that I'll figure it out - or die trying!